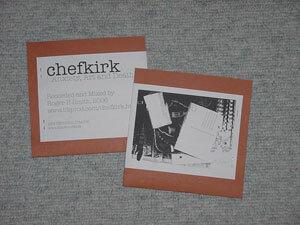 The name Chefkirk [website] vaguely rings a bell, I think I’ve encountered this band already, either on a compilation or on another CDr-release. Chefkirk’s site on the other hand is hosted by Tibprod [website], a label I’m familiar with cause it’s run by Iversen (Norway), who played in De Living some time ago together with Bjergen [that was at edition 21, read the review over here]. Eitherway this “Anxiety, Art and Death”-entitled CDr is the first one I get to review from this North American band. Released on Dim Records [website] this is at the same time the first release I review from this label based in Holland. I got a couple of releases from them some time ago, and they sure were no dissapointment, on the contrary! The Chefkirk CDr, lasting some 47 minutes, contains 4 tracks sporting quite an interesting mix of guitardrones ‘n loops, intersected by abbressive electronics in the form of short electric cuts’n pulses, sudden harshnoise-blasts and more electro-accoustic oriented sounds. The first 10 minute lasting track starts with a hefty guitardrone, suddenly shifting in a more noisy crescendo before going over in a looped guitarslash-riff interlaced with what sounds like something breaking (A contactmike beging squashed?). The next 12 minute-lasting tracks starts off in a quiet manner, contrasting the abrupt start of track 1: isolated cracks, then more cracks, then more more delayed cracks, morfing into white noise and eventually cumultating into a storm of white noise, and even what sounds like a beat. The last minute is heavenly distorted. Track 3, 5 minutes in length, is centered around an improvised, yet melodic, “guitar-riff” - which actually is a loop lasting some 10 seconds I think - over which white noise and cracks are layered. Things sound more and more broken towards the end. Dreamy and introspective. Track 4, with its 20 minutes the longest one on this release, sounds like a heavy damaged record, it’s pretty cut-up in a K2-style, and I think that at 45rpm some parts would come close to the Gerogerigegege. Well varied, and by times sporting a neatly hidden beat under a layer of harsh stuff, in the 9th minute things even seem to take an acid-flavoured turn. So all in I consider this an excellent record, combining some pretty good old-skool-elements with some pretty cool “newer” stuff. Get it from the equally excellent DIM Records. Be quick, cause this one is limited on 33 copies. Two weeks we introduced Dim Records as a new CDR label, and already Chefkirk threw them a master in a ploy to have a release on every CDR label in the world. No political theme here and now, but the start is promising: soft (! ), concrete (!) and letting the sounds work their way. Half way through the second track things explode into the usual barrage of noise. The third piece opens with a bass guitar being played freely and some crackling noise, which grow in loudness and aggressiveness. The final piece is again just noise. An interesting release, since it shows us another Chefkirk, one that may be able to change the menu, but it is something he is probably now afraid to do. Let's hope this is a route he will explore.